JDC - Archives : Girls sewing in the Ilaniah Village as part of a JDC funded training program. Title Girls sewing in the Ilaniah Village as part of a JDC funded training program. Description Young women learning to sew in Ilaniah, a JDC supported facility near Apeldoorn. 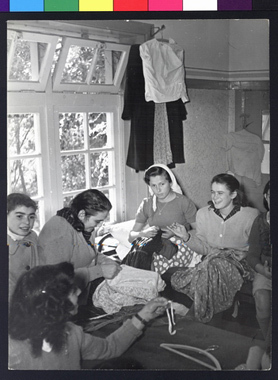 The children's home houses five hundred Jewish orphans from German DP Camps and Romania, where they hope to stay until they can immigrate to Israel. The children are provided with basic necessities, education, and special ORT vocational training.